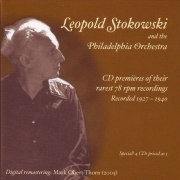 Brahms‘s Hungarian Dance No.1 performed by the Philadelphia Orchestra conducted by Leopold Stokowski. I know, nowhere as obscure as Konstantin Ivanov! Recorded in 1934, first released as Victor Red Seal 1675, and now available in Music & Arts’ superb four-disc survey of ultra-rare Stoky-Philly recordings.